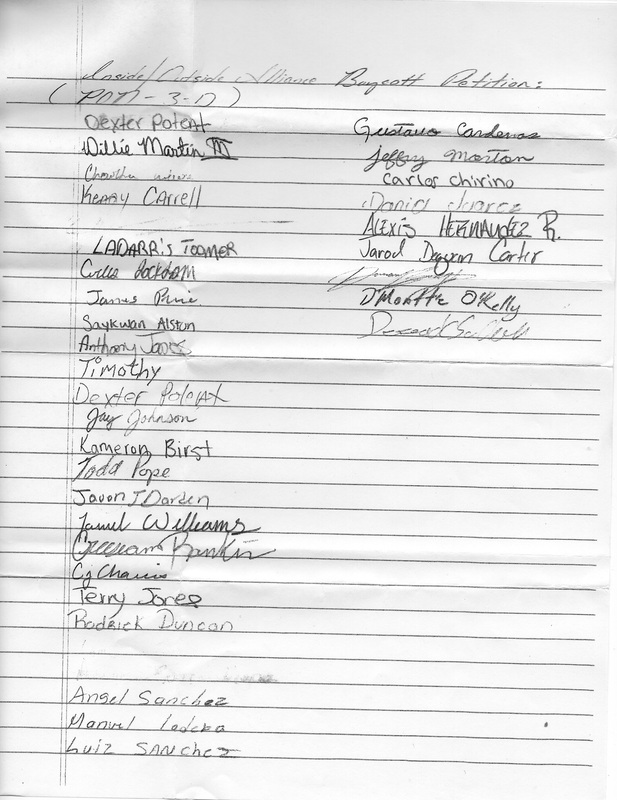 This letter here is in regards to all inmates, the signatures are in accordance with those who are in full agreement of the “First Five Grieving Committee of the Durham County Jail.” The 2nd letter to whom it may concern is not based according to thoughts or opinions, it’s based according to outside resources and research done in accordance to the agencies or departments stated. This letter was written and prepared by —. We’re supporting him in agreement. We would LOVE to see this taken seriously and put into investigation on such governmental officials. What needs to be done NOW!!! !, which would be nice, is them stepping up and proving all of us in Durham County Jail wrong. I would also love it if you would post this on your Facebook page and tag it to my page. Thanks for all your support. Stay in touch. God Bless You All, IOA. My name or who I am is not very important at this point in time. “WE,” the people in the Durham County Jail finds you at fault for criminal acts that is indictable, holding people hostage unjustly, while in the Durham County Jail, by giving us overly excessive high bonds for non-violent offenses and violent offense. We have placed our own investigators throughout the Durham Co. Jail. “We” have found said parties to be in fault of holding inmates against their will by unjust acts of unfair practices. These acts involve the governor, mayor, chief of police, magistrates, and corrupt police, sheriff and state patrol officers, including FBI and SBI departments, and the DA office. “We” also find you at fault of tampering with evidence and planting evidence, or withholding evidence by working with the Magistrate of this Jail, making up evidence, so that the arrestee can get higher bonds and more serious charges than what’s actually intended, where it is then indictable to superior court. I hope you take this letter serious enough and call it a “courtesy call” from me to you. STOP! treating us like just another statistical number of this already deteriorating society because of economical causes by the Government. STOP! undermining society’s apocalypse. “We” all matter not just those in higher positions of life. When the news of corruption comes to light, some people will have to retire and/or resign, or get fired; while others that are in the elected offices will not get re-elected!! I will also guarantee you, that you are about to see some of the biggest (PEACEFUL) street and in-house demonstrations that the City of Durham has ever seen. There is no need to find out who I am because already it’s too late. This entry was posted in bond amounts, c.o. harassment, c.o. incompetence, commissary prices, conviction rates, detention without end, direct action, durham police, educational opportunities, independent investigation, mail withheld, manifesto, necessities, outside solidarity, Uncategorized and tagged 'guilty until innocent', Commissary, Corrections officers, courts, grievances, indefinite detention, jail inspection, Jailhouse writing, police, resistance. Bookmark the permalink.